I was reading the comments on picture #25587, the Wilson/Ross dinghy, and wss amused how the comments went from dinghies to a treatise on Orkney wells. 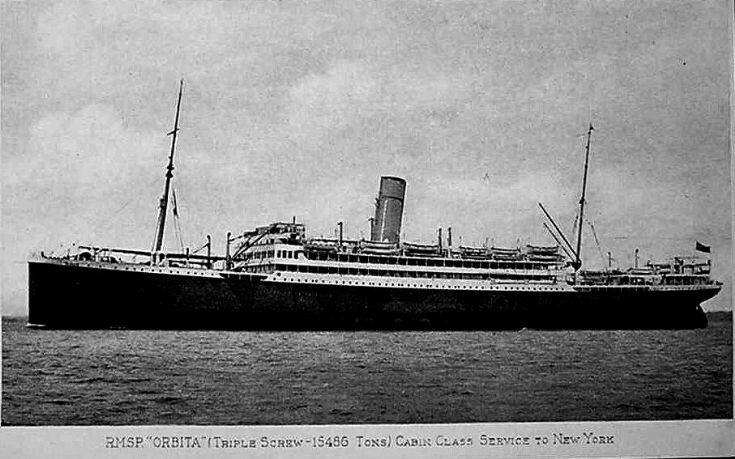 The only thing missing was a word about the troopship SS Orbita so I have added a photo of her. She looks very modern for a ship launched in 1914. served a s a troopship during WW1. Commissioned for the mail run to New York, later ferried immigrants from Jamaica, then to Australia and finally ended her days as a troopship in WW2, scrapped in 1950. Tom - I put on the photo of my father's dinghy the Orbita. Looking at your photo (and contributor notes)with my mother, she thinks she was at school with you at KGS, 1938-44. She was Tess Slater in those days. She'd be interested to hear from you. I sailed from Liverpool to Port Elizabeth S.A. Dec.18th 1940. We were RAF bods and the convoy was shelled by a German heavy cruiser on Christmas morning I believe one ship was hit but the rest sailed on safely, first stop Freetown. My family sailed on the Orbita on the 12th of February 1949 from Liverpool bound for East Africa. As an 8 year old this was an adventure of a life time after the hard life in England during and after the war.. It was a trip that I have never forgotten. My mother, sister, brother and I went to Kenya on the Orbita in February 1949. Sadly I don't recall the trip as I was not quite three years old. We went to join my father, already out there. My father was in the navy. I know he was on the Orduna and I think he was on Orbita. I have been searching for his records but I can't find any anything. His name is Thomas Mc|Ilraith. Can anybody tell me where I can look? I sailed from Liverpool in April 1950 to Ceylon,now Srilanka,with my mother and younger sister on the troopship Ss Orbita.I was almost 9 yrs old.My father was in the RAF and already in Ceylon after already serving in the middle East for a few years. He was a aircraft fitter. The journey was so exciting and memorable,especially going through the Suez Canal. We left Ceylon for the UK in Nov 1951 I can remember everything so well ,what an experience. My father's name is William Alexander Tait. Sadly he died in 1968 at the age of 54.